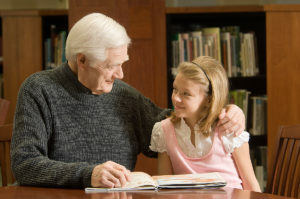 What can the older generation do in order to support and encourage the younger generation? Do you have a favorite recipe that you have perfected for many years? Maybe something that can only be taught in the kitchen, or with a pinch of this and a dash of that. This is a great opportunity to develop highly transferable skills, from hands-on math conversions to staying with a project from beginning to end. Remember, those messy young sous chefs will one day cook entire meals for their family and friends. Do you carry with you a wealth of childhood stories? With your stories you can give the younger generation an insight into the lifestyle of your childhood. You can teach what books cannot! These stories pass on life lessons that allow the younger generation to become a part of something larger than themselves. Have you encountered difficult people in your life? Think about how many different types of people you have had to interact with. You have a wealth of experience and know a lot about behavior and manners that the younger generation has not yet acquired. Use your experiences and examples to encourage and support the younger generation with problematic relationships. Teach them techniques to respond instead of react when interacting with impossible people. Are you a great motivator? Can you move the younger generation from the couch and video games to a more active lifestyle? Be creative! Encourage outside activities such as splashing in muddy puddles, tossing a ball, gardening and the good old fashioned games of tag and hide-and-seek. Give the younger generation a better line of sight on how their actions make a measurable difference in their own happiness. The energy of the younger generation mixed with the experience of the older generation can do wonders in a society! I challenge you to take an interest in the younger generation by passing on your AgeEsteem and making a positive difference in the youth of today.